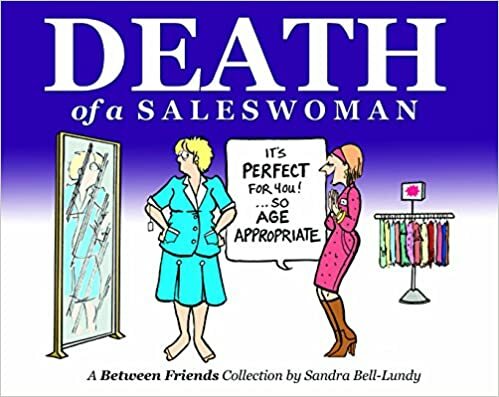 Sandra Bell-Lundy's hit cartoon strip Between Friends is brilliantly entertaining and it captures something that very few people do with panache: shows supportive real- fifty-something women dealing with things women cope with every day in funny and relatable ways. Sandra Bell-Lundy, a proud Canadian, drew comics even as a child and that continued while she was studying at Brock University. 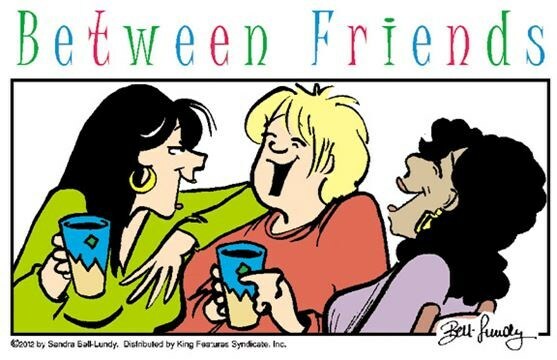 Her newly formed comic strip, Between Friends, was picked up by some Canadian dailies. In 1994, Kings Features Syndicate picked it up and it has been syndicated to 175 newspapers in the United States and Canada. It also has appeared in ten other countries. Between Friends is about Maeve, Susan and Kimberly, three middle-aged professional women and their lives and the people with whom they share it. Two are married and one is divorced and currently single. Sandra Bell-Lundy writes about things that interest her. Her stories are funny, relevant, and kind. They feature different, but amazing women and their families. She isn't scared to take on tough subjects covered in compassionate, yet realistic ways suitable for a family-friendly comic including: divorce, uncertainty with work, fertility problems, dating issues, kids having fits while in public, women's health and domestic violence. But at the center of everything is the three friends. She has published three collections of her works, so far. The witty and thoughtful cartoonist, Sandra Bell-Lundy connected with Michelle Tompkins for TheCelebrityCafe.com about her love of comics, the origins of Between Friends, how a personal situation influenced one of her most notable storylines, what makes Between Friends special, her thoughts on #MeToo, what she likes to do for fun and more. Sandra Bell-Lundy: Welland, Ontario. I’m quite close to the border at Buffalo, New York. Sandra Bell-Lundy: I studied French at Brock University. Michelle Tompkins: Is there any info about your personal life and family that you would like to add? Sandra Bell-Lundy: I’m married to Tim who is a Funeral Director and have two children (a son and a daughter) who are both university graduates and pursuing higher education. Sandra Bell-Lundy: I used to coordinate the ads for a small grocery chain. I was working for the Duty-Free Shoppe in Fort Erie just before my comic was syndicated. I worked at a little Par 3 golf course in high school. Sandra Bell-Lundy: I’ve always drawn as far back as I can remember. It wasn’t really a hobby…it was just something I naturally seemed to be doing all the time. I would even doodle while I was on the phone…I still do. Sandra Bell-Lundy: I guess it’s because I love reading comics. I read them every night in the newspaper when I was a kid. I liked reading Archie comics and I used to buy the little Fawcett Crest collections of Peanuts. In grade school, a friend and I used to draw comics about a little girl. (We each had our own character.) We’d spend hours reading each other’s comics. In high school, I would draw comics of my friends to lampoon some situation about boyfriends or school for laughs. It’s the way I express myself. Sandra Bell-Lundy: The best part about creating my comic strip is that I have a career doing something that I would be doing whether I was paid to do it or not. Writing a comic that makes me laugh or that I feel is expressing something I want to communicate is just something I like to do instinctively. On the technical side…the best part is the inking. That’s when the comic comes to life for me. The worst is the 24-7 deadlines. There’s no reprieve for any hurdles life throws at you. Sandra Bell-Lundy: Not at all. I think there’s more interest than ever in comics. Sandra Bell-Lundy: Comics are a unique medium for telling a story or making a point whether it’s humorous, serious or informative. Images have tremendous power for attracting attention. I wrote an intermittent storyline about domestic abuse in my strip and the response was actually quite overwhelming. One father of an abused woman wrote to me and said he was hoping his daughter was reading my comic and that it might have an impact on her and influence her to leave her abusive partner. He said his daughter’s partner would threaten her by waving a gun around the house. A woman’s shelter said they welcomed the storyline in the comics because it presented information in a non-traditional venue and they felt it would reach a segment of society that might not be looking in the regular channels of information. Comics can be an extremely powerful way to express a message. Michelle Tompkins: How did you come up with Between Friends? Sandra Bell-Lundy: Between Friends evolved from the comics I used to draw about my own friends about things that happened to us. Michelle Tompkins: How would you describe Between Friends to someone who hasn’t seen it? Sandra Bell-Lundy: Between Friends zeroes in on the nitty-gritty details of the lives of three 50-something women friends. Witty and personal, sometimes poignant and candid, this slice-of-life strip celebrates women-of-almost-a-certain-age in all their stress-filled, scintillating glory. Michelle Tompkins: Maeve, Susan and Kim are such rich characters. Please tell me how you came to develop them? Sandra Bell-Lundy: When I first designed the strip, I had five characters. Each character was modeled on myself and some close friends. A syndicate editor advised me to take the main characters down to three…so I took the most distinct characteristics of the five and molded them into Susan, Maeve and Kim. These characters have evolved as individuals in their own right over time. Michelle Tompkins: What do you like best about these women? Sandra Bell-Lundy: I identify with certain characteristics of each of the women so I enjoy exploiting those traits in the gags. It’s like having a good laugh at myself. Michelle Tompkins: There aren’t too many shows or strips that focus on women over 50, but yours does with panache, did you always plan to focus on mature women? Sandra Bell-Lundy: Thank you! The nucleus of the Between Friends came from perspectives and situations that my friends and I experienced. When the strip launched with King in 1994, the women were in their mid-thirties and that’s what was reflected in the strip. They’ve aged over the years because I’ve aged and my perspectives and life experiences have changed. It’s been a gradual process. They don’t celebrate birthdays…things just gradually change…for example, they began wearing reading glasses around the time I began wearing them…and they dealt with the empty nest when I began dealing with it. Basically, it’s been write what I know. It’s not a mirror of my (or my friends’ lives) but a reflection of the changing issues we face as we age. Sandra Bell-Lundy: I’ve always liked Maeve’s ex-husband, Simon. Simon messed up when he cheated on her early in their marriage and Maeve has never been able to let that go…even though she really does have a connection with him. Poor Simon…I feel bad for him because he really loves Maeve and I think deep down Maeve really loves him too. (this probably sounds weird…I know I’m in control of the writing but these characters sort of write themselves…I tend to follow where they take me) A lot of readers really don’t like Simon….but I have a soft spot for him. Michelle Tompkins: Wine, chocolate and great conversations seem to be key components in your strip. Sandra Bell-Lundy: LOL. They’re key components in my life too. Michelle Tompkins: I like what you did for International Women’s Day. Michelle Tompkins: You also feature a diverse cast. Was that always your intent? Sandra Bell-Lundy: I don’t have a plan. Things unfold by themselves. Sometimes I bring in a new character but they don’t “take.” It’s all pretty organic. Sandra Bell-Lundy: It’s roughly 60/40 women to men. Mainly late thirties to 60+. Sandra Bell-Lundy: I’m not as structured as I’d like to be but it’s not through a lack of trying. Everything revolves around how my writing goes. I brainstorm in a notebook…choose 6 ideas that work and then flesh them out. I pencil, ink and scan and finish up in Photoshop. Michelle Tompkins: What are some other strips that you particularly admire? Sandra Bell-Lundy: It’s really difficult to say because there are so many cartoonists that I know and admire that I hate to list just a few and leave out the others. Michelle Tompkins: Are there any other creative endeavors that you want people to know about? Sandra Bell-Lundy: I have just released Between Friends greeting cards with NobleWorks Cards. Sandra Bell-Lundy: Mostly, they comment on particular strips that resonate with them…like, 'LOL that happens to me,' I find that when I am writing an ongoing storyline, readers become very caught up in the situation the character(s) are going through. I’ve been asked to change outcomes or have been chastised for whatever a particular character is doing. Sometimes readers send me very thoughtful comments telling me about how they’ve experienced similar situations in their lives. It’s surprising in one way because these are just comic characters but mostly I find it very flattering that readers are that tuned in. Sandra Bell-Lundy: I’ve written some personal graphic essays which have been published. I have a few essay ideas on the backburner I would like complete. I’m almost finished writing a graphic novel and would like to find a publisher. I’ll see what happens. Sandra Bell-Lundy: I won an award for the fertility and adoption story I wrote and also for a storyline about Maeve seeing a counselor. Sandra Bell-Lundy: My characters are Canadian but it doesn’t figure into the strip in a big way. Mostly, I get edited (or at least questioned) for Canadian-ized references that don’t make sense to my American editor. I draw milk in a bag. Michelle Tompkins: How do use time in your work? How do characters age? Sandra Bell-Lundy: I follow the Canadian seasons but as far as the characters themselves, they have aged gradually and subtly over time. No birthday landmarks. Michelle Tompkins: What are some of the most controversial issues you have dealt with in your work? Sandra Bell-Lundy: The domestic abuse storyline was the biggest one. I did a lot of research on that because I knew it would be very important to get the substance of the story right. I also wrote about infertility and adoption. Michelle Tompkins: Do you have anything you wish to share about your thoughts on #MeToo or #TimesUp? Sandra Bell-Lundy: I have a lot of thoughts on the #MeToo movement but it would be difficult to discuss them in a short Q & A. It's pretty apparent that it's necessary for women to demand injustices be addressed. I find it very heartening that so many women have been motivated to enter the political arena because that's where a difference can be made. Michelle Tompkins: Do you think it is a cartoonist's responsibility to comment on the world around them? Sandra Bell-Lundy: I wouldn't say it's a cartoonist's "responsibility" to comment on the world around them. Cartoons DO comment on the world around them because that's the nature of what a cartoon is: a message. What that message is depends on the voice of the cartoonist. I think what you're asking me though, is it a cartoonist's responsibility to comment politically...and to that, I would say no. Some people are political, some aren't. I think a cartoon is a powerful way to communicate political issues...but if that's not what or how a cartoonist wants to communicate, well, that's up to them. Michelle Tompkins: Is there any topic that is too serious for you to bring up in Between Friends? Sandra Bell-Lundy: My criteria for what I write about in Between Friends is (1) things that I have interest in and (2) issues that gel with the premise of my strip and its characters. There probably isn't anything that would be too serious to bring into the strip if it felt like it was a natural fit to discuss. If the topic was particularly unsettling (such as the domestic abuse series) it would require careful editing because the mainstream newspaper comic page is pretty G-rated. Michelle Tompkins: The adoption arch struck a chord with many people. How did you come up with that? Sandra Bell-Lundy: When I began the strip, it featured three women…one single, one divorced and one married. No children. I gave birth to my first child at the same time my strip launched with King Features and I had my second a few years later. Eventually, the influence of having kids became too hard to ignore and I decided to bring kids into the strip. The problem for me was that my husband and I had experienced three miscarriages and had been to a fertility clinic. It was a very sad and frustrating time and after all that we had experienced, I just couldn’t bring myself to have my Susan character simply wake up one day and happily discover she was pregnant. The idea seemed like a big fat fairy tale to me. So I decided to have Susan gradually realize that she was having trouble conceiving. I was going to have her give birth eventually (because that was what happened to me) but reader input made me change my mind and I had her and Harv adopt a baby girl. So the story wasn’t a mirror of what happened in my personal life but the frustrations and sadness we experienced did influence many strips. Michelle Tompkins: Now your domestic violence story is incredibly memorable. What kind of feedback did you receive on that? Sandra Bell-Lundy: The response was overwhelming. I heard from abused women, parents, clergy, university professors, high school teachers, law enforcement and more. When the final weeks of the story appeared in the newspapers I was flooded by e-mail every morning. Some of the mail was tough to read and several times I sat at my computer and just cried. Michelle Tompkins: Where can people find it? I have looked for it for a long time. Sandra Bell-Lundy: I’ve been asked many times for copies but I’ve never found the right place to publish it. I would still like to do that at some point. Note: You can find the beginning of this important storyline here and it goes through November 22. Michelle Tompkins: Please tell me about your connection to the Canadian Cancer Society for their campaign to promote regular mammograms in the early detection of breast cancer? Sandra Bell-Lundy: I was asked if I would assist them by creating comics (using my characters) to address issues that women commonly mentioned as reasons for not having a mammogram. I was happy to do this. Michelle Tompkins: How is each of the romantic relationships different? Sandra Bell-Lundy: Susan and Kim have what I would call an average marriage. It’s cathartic to poke fun at the familiarity of long-term married couples. Maeve is where I can really have fun. I had her date Viggo Mortensen once. Michelle Tompkins: Are there any storylines that you are dissatisfied with? Sandra Bell-Lundy: No…once in a while there are individual strips that I’m not happy with…and sometimes I have trouble with a punchline but I have to send the strip out to meet a deadline…and then when I read it later in the paper, the solution hits me. That’s frustrating. Sandra Bell-Lundy: The ideas come from everywhere…online, magazines, real life, newspapers, friends, family…I read something or someone says something that, for some reason, clicks with me. Deadlines are the great motivator in dealing with writer’s block. Michelle Tompkins: How do you connect with your fans? Sandra Bell-Lundy: Mainly online through social media or else when I give a presentation. Michelle Tompkins: Do you go to Comic-Cons? Sandra Bell-Lundy: I’ve been to a few Comic-Cons and also various Comic Festivals. Sandra Bell-Lundy: I don’t have any plans to stop yet. I still have stuff I want to do. I think it would be difficult to pass the strip on to someone else…I think the nature of it is too personal. Michelle Tompkins: Have you been approached to adapt any of your work to TV or movies? Sandra Bell-Lundy: I spoke with a producer for television once but nothing came of it. Sandra Bell-Lundy: I still use very traditional tools…pencil, ink. I scan and finalize in Photoshop. I keep promising myself to make the jump to a Cintiq but the learning curve keeps scaring me off. Sandra Bell-Lundy: I have notepads all over the house. Sandra Bell-Lundy: I think the future of comic strips is very promising as there is so much interest in comics these days. The distribution element is what is in transition. Things will sort themselves out. Sandra Bell-Lundy: I’ve had two books with traditional publishers but they are now out of print. I self-published one (Death of a Saleswoman) that I sell when I give presentations. Readers can purchase a copy directly from me by contacting me through my Between Friends website. www.betweenfriendscomics.com I’m thinking about publishing through Amazon. Sandra Bell-Lundy: I’ve worked with the Canadian Cancer Society and I’ve donated original artwork or done presentations to assist a variety of charities over the years. Sandra Bell-Lundy: There are no cartoonists in my area and I stay in touch with most of my cartooning friends online so I really love it when I have the chance to travel to a festival or to Toronto to connect in person. I like gardening and love to go to the movies. Michelle Tompkins: What movies, TV shows or books do you enjoy? Sandra Bell-Lundy: Silicon Valley, The Walking Dead, Frankie and Grace, Manhunter. I like movies about real people and historical events. As for books, I mostly read biographies and graphic novels. Michelle Tompkins: What advice do you have for an aspiring cartoonist? Sandra Bell-Lundy: Draw and write often. Be open to critique and advice from professionals. Stay true to yourself. Have a presence on the web. Don't be afraid to take some risks. All strips featured here copyright 2018 by Sandra Bell-Lundy and are printed with permission of King Features Syndicate. Sandra Bell-Lundy may be found here and you can find her strip view King Features Syndicate at Comics Kingdom here.